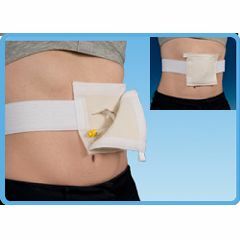 The Tube-Pak Management System was designed by the wife of a gastrostomy patient who disliked the way her husband’s G-Tube was constantly being taped to his body. Tube-Pak eliminates the need for clumsy pins and tape, and is by far the most comfortable way to secure all types of enteral feeding tubes. Tube-Pak increases your patient’s level of tube control, and may lead to increased patient self-care. It also minimizes the risk of “Accidental Pull-Out” in combative patients and small children. Care Instructions: Tube-Pak’s flannel center pouch and soft elastic fabric waistband are conveniently machine washable. Be sure to engage all hook and loop closures before washing to prevent lint accumulation. We just received the product and my husband asked me to take it off after a couple of hours because of the scratchy velcro edges. I've trimmed the offending edges off, but it something that needs to be addressed by the maker of the product. My husband no longer has the manual dexterity to have done the trimming, so someone living alone would have a problem. I wouldn't recommend it as it is. SHIFTED AND PULLED THE FE. SHIFTED AND PULLED THE FE. FEEDING TUBE. MY HUSBAND WORE IT BUT FOUND THAT THE BELT SHIFTED AND WOULD PULL ON HIS FEEDING TUBE. VERY UNCOMFORTABLE FEELING WHEN THAT HAPPENS. oF COURSE WHEN I CALLED AND TOLD ALLEGRO MEDICAL OF MY DISPLEASURE THEY JUST SAID SORRY , NOTHING WE CAN DO BECAUSE YOU OPENED THE PACKAGE. WELL, HOW DO YOU KNOW THERE WILL BE A PROBLEM UNLESS YOU TRY IT ON! Excellent product. Exceeded all of my caregivers expectation. The visiting nurse was very impressed. Lightweight. Sturdy. Easy Storage. Convenient. With gatric tube. With gastric tube. My husband has a G-Tube because he has difficulty at times swallowing liquids and his meds that he takes for Parkinson Disease. It is a great help in keeping the tube in place, allowing easy access to give meds and fluids and preventing accidental pull on it.